Patron of: Policemen, Firemen, Grocers, Health, Knights, Mariners, Soldiers, Health, Holy Death, Physical Protection, Court Cases, Justice, Defense, Strength, Lawsuits. 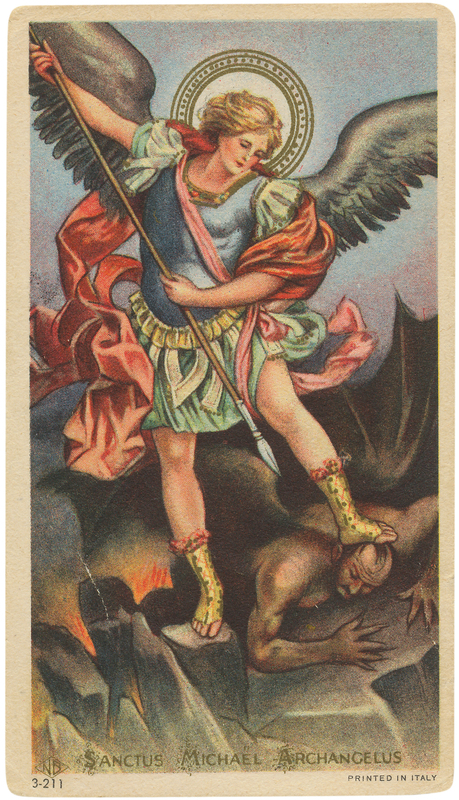 Ever vigilant against evil, Michael the Archangel is most invoked for protection and justice. 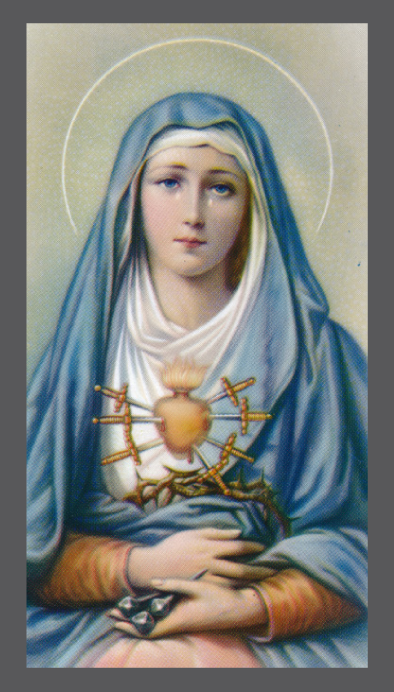 His novena is said by those in need of protection as well as those who are in need of justice. According to the Book of Revelations, Michael was the angel who rose to God’s defense when Lucifer, God’s favorite and most beautiful angel decided that he was God’s equal. Leading a band of renegade angels he made an attempt to take over the throne of heaven. One outraged angel shouted, “Who is like God?” (mi-cha-el) and struck down Lucifer and his group, casting them into hell for their vanity. This angel took the name Michael as a reminder of his loyalty. A popular figure to the ancient Jews, early, Christians and Muslims, he is closely tied to the history of mankind and serves as its guardian. Michael’s role in the world is firmly mandated: 1) He is to fight against Lucifer, no matter where he might be. 2) He is to rescue the souls of the faithful from the power of evil, especially at the time of death. 3) He is the champion of God and the protector of the Church. 4) He brings souls to justice, weighing the souls of the dead and deciding on who gets into heaven and who gets into hell. Since Michael was the one who threw Lucifer into hell, Lucifer and the denizens of hell have no power over him. Catholics believe that Michael and the Virgin Mary are the only beings besides Jesus who can go into hell and release souls who are suffering there. Because of their actions in the great battle of heaven, it is Lucifer’s fate to reside in the lowest netherworld and it is Michael’s to dwell nearest to heaven. His shrines are the most ancient and natural in Christendom and tend to be on high, inaccessible cliffs that only a celestial being could reach. The Gargano caves in Apulia, Italy are said to be the first earthly dwelling place for the archangel. They have been an immensely popular pilgrimage site since the year 490 AD. Saint Michael the Archangel is considered the most powerful of all angels. Christians in the East see him as a great healer, crediting him with the creation of many healing springs. In the sixth century, as Rome was being devastated by a plague, Pope Gregory I saw the archangel hovering over the tomb of the Emperor Hadrian, brandishing his sword. He interpreted this to mean that Rome was under the archangel’s protection and the plague would soon cease. A church was built over the tomb still bearing the title Castel San Angelo in honor of Michael. Immensely popular throughout the world, Michael is always shown brandishing a sword while standing on the neck of the devil (sometimes interpreted as a giant serpent). In many images he holds the scales that will weigh the souls of the dead, because of this he is the patron saint of greengrocers who use these scales. Saint Michael the Archangel, loyal champion of God and his people, I turn to you with confidence and seek your powerful intercession. For the love of God, who made you so glorious in grace and power, and for the love of the Mother of Jesus, the Queen of the Angels, be pleased to hear my prayer. You know the value of my soul in the eyes of God. May no stain of evil ever disfigure its beauty. Help me to conquer the evil spirit who tempts me. I desire to imitate your loyalty to God and Holy Mother Church and your great love for God and men. And since you are God’s messenger for the care of his people, I entrust to you this special request (your request here). Saint Michael, since you are, by the will of the Creator, the powerful intercessor of Christians, I have great confidence in your prayers. I earnestly trust that if it is God’s holy will, my petition will be granted. Pray for me, Saint Michael, and also for those I love. Protect us in all dangers of body and soul. Help us in our daily needs. Through your powerful intercession, may we live a holy life, die a happy death, and reach heaven, where we may praise and love God with you forever. Amen.